A regular breeding resident and migrant throughout the state; also regular during the winter season, particularly in southern Minnesota. The Canada Goose was an abundant species during the Minnesota Breeding Bird Atlas (MNBBA). The Canada Goose is widely distributed across North America, from Alaska south through Canada and the continental United States. The breeding distribution of the Giant Canada Goose, the subspecies that breeds in Minnesota, stretches across the southern regions of the eastern Canadian provinces, south through the eastern Dakotas and Central Plains states to the Gulf coast, and east to the Atlantic coast. 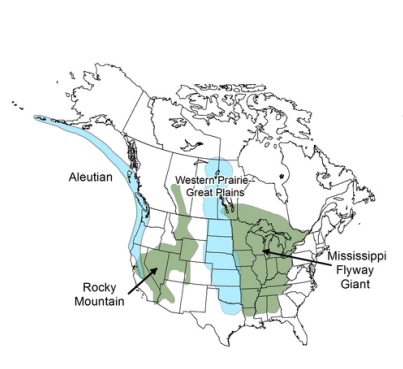 Breeding densities are especially high in the northern Great Plains, including southern Manitoba, central North Dakota, and northwestern Minnesota (Figure 1). A game species, the Canada Goose is assigned a High Continental Priority by the North American Waterfowl Management Plan; current population numbers exceed the plan’s objectives. It was assigned a Continental Concern Score of 6/20 by Partners in Flight. A resident to short-distance migrant. In addition to the spring migration of breeding geese, there is a notable migration of nonbreeding (1-year-old and some 2- and 3-year-old geese) and failed breeding geese that occurs northward in late May and early June. These migrants head to northern and subarctic areas, where they then molt their flight feathers and spend the summer (Hanson 1965). Feeds on submerged aquatic vegetation in wetlands and lakes and grazes on grasses, sedges, and grains in uplands. A depression located on elevated sites within or adjacent to wetlands; muskrat houses and artificial platforms are frequently used. Breeding distribution and relative abundance of the Canada Goose in North America based on the federal Breeding Bird Survey, 2011–2015 (Sauer et al. 2017). Seven different Canada Goose subspecies have been delineated (Baldassarre 2014). The largest among them, the Giant Canada Goose (Branta canadensis maxima), was a common summer resident in Minnesota prior to the late 1800s. Yet even Hatch, in the first comprehensive account of Minnesota birds published in 1892, noted that this formerly abundant species was declining in the southern counties as the human population increased. By the time Roberts (1932) wrote his account of the Canada Goose 40 years later, even populations in the remote counties of northwestern Minnesota were decimated in the face of extensive wetland drainage, overharvest, and egg collection. The last goose documented nesting in the state was in 1920 on Swan Lake in Nicollet County. At the same time, the Giant Canada Goose was largely absent from many of its traditional breeding grounds in North America, leading waterfowl biologists to assume that the species was extirpated throughout much of its range and perhaps even extinct. In light of its absence, the U.S. Fish and Wildlife Service began efforts to transplant birds from captive flocks onto many national wildlife refuges, including in Minnesota (Janssen 1987). Birds from Missouri and Michigan, for example, were transplanted to the Agassiz National Wildlife Refuge in the early 1950s (Dokken 2012). But the species’ future really changed when, in the winter of 1962, it was “rediscovered” wintering on Silver Lake in Rochester, Minnesota (Hanson 1965). For years a small flock of resident geese had resided in Rochester. The first flock, secured from a private breeder in North Dakota, was originally introduced by one of the Mayo brothers onto their private estate in 1924 (Eckberg 2010). Then, in 1936, after damming and widening a stretch of the Zumbro River that flowed through the city and created Silver Lake, city officials also introduced a small flock of geese, hoping to establish a resident breeding population on the lake. When Dr. Mayo stopped feeding the birds on his property in 1939, his flock dispersed to other nearby sites, including Silver Lake. This small population persisted and grew further when a former patient at the Mayo Clinic purchased another 12 birds. But the real game changer was the construction of a power plant on the lakeshore in 1948. Its warm-water discharge kept the lake open throughout the winter, attracting migrants from unknown breeding grounds located far to the north in Canada to stay throughout the winter. By 1960 the winter flock had grown to 4,000 geese, and residents began to notice that some of these birds were extremely large. Banding data indicated that the geese that wintered in Rochester nested in the Interlake Region of Manitoba (Hanson 1965). The “rediscovery” of the Giant Canada Goose in Minnesota led to a surge of new and expanded efforts to reintroduce the bird to Minnesota and surrounding states. Successful by all accounts, today, B. c. maxima is the most abundant and widely distributed subspecies of the Canada Goose in North America. By 1975, when Green and Janssen prepared their updated account of the species’ status in Minnesota, the Giant Canada Goose was an established breeding species in all but the northeastern region of the state. Populations continued to expand throughout the latter half of the 20th century, especially in metropolitan regions where the birds were protected and found abundant nesting and foraging opportunities. From 1970 through 1998, they were confirmed nesting in 65 of Minnesota’s 87 counties (Hertzel and Janssen 1998). Today the Giant Canada Goose remains a widely distributed and abundant breeding species throughout the state. During the MNBBA, participants reported 4,877 Canada Goose records in 53.3% (2,618/4,916) of the surveyed atlas blocks and in 59.6% (1,393/2,337) of the priority blocks. Breeding was confirmed in 1,289 (26.2%) of the surveyed blocks (Figures 2 and 3; Table 1). The birds were observed and confirmed breeding in all 87 Minnesota counties. MNBBA data were used to predict the species’ statewide abundance based on habitat suitability (Figure 4). The core of the species’ breeding range is predicted to occur in Minnesota’s central and western counties. Today, the Giant Canada Goose has not only become well established and abundant throughout its former breeding range in the United States, but birds have also been translocated from sites where populations have become a nuisance to sites in the southern and southwestern United States beyond their traditional range (Mowbray et al. 2002). From these relocation sites, the birds have continued to expand and increase in numbers. Breeding distribution of the Canada Goose in Minnesota based on the Minnesota Breeding Bird Atlas (2009–2013). Summary statistics of records by breeding status category for the Canada Goose in Minnesota based on all blocks (each 5 km × 5 km) surveyed during the Minnesota Breeding Bird Atlas (2009–2013). Summary statistics for Canada Goose records by breeding status category for all blocks and priority blocks (each 5 km × 5 km) surveyed during the Minnesota Breeding Bird Atlas (2009–2013). Landcover suitability of the Canada Goose in Minnesota based on habitat, landscape context, and climate data gathered during the Minnesota Breeding Bird Atlas (2009-2013) using the MaxEnt modeling approach. A wide range of habitats are selected during the breeding season, including forested and prairie wetlands, large reservoirs and impoundments, and small urban ponds in city parks (Figure 5). Despite the diversity of sites selected, two features are universal: high-quality foraging habitat, and dry, elevated sites in or near water for nesting. Geese are grazing herbivores that feed on aquatic plants as well as on grasses, sedges, and cultivated grains, so upland foraging habitats need to be located close to water. Wetlands, lakes, impoundments with islands, or suitable elevated sites along the shoreline are required for nesting (Mowbray et al. 2002; Baldassarre 2014). Typical breeding habitat of the Canada Goose in Minnesota (© Lee A. Pfannmuller). Waterfowl biologists have delineated multiple management units across the United States and Canada for monitoring and regulating the harvest of Canada Goose populations. Minnesota’s breeding population is included in the Mississippi Flyway Giant Canada Goose management unit, which stretches from the eastern edge of the Great Plains region to the western edge of the Atlantic region, and from southern Manitoba and Ontario south to northern Louisiana, Mississippi, and Alabama (Figure 6). Within this unit the population of Giant Canada Geese has grown exponentially from less than 800,000 birds in 1992 to over 1.6 million in 2015 (Figure 7; Zimpfer et al. 2015). When populations from all management units were combined, the 2015 Canada Goose population numbered 5.1 million birds, of which nearly 32% were the Giant Canada Goose subspecies, B. c. maxima. The successful recovery of the Giant Canada Goose is attributed to a range of factors, including intensive restoration efforts in the latter half of the 20th century, the species’ adaptability to a wide range of habitats, its tolerance of urban/suburban landscapes, ample food supplies, minimal harvest pressure in urban environments, and the absence of natural predators (Baldassarre 2014). Breeding densities are extremely variable depending on local conditions. In Alaska alone, territory size ranged from as small as 2.5 m2 to nearly 1,800 m2. When suitable nest sites are limited, nests may be as close as several meters from one another (Mowbray et al. 2002). In Minnesota, there are two long-term monitoring efforts that track population trends. The first is the federal Breeding Bird Survey (BBS). Although it is not a particularly effective tool for monitoring many waterfowl populations, for common and widely distributed species, such as the Canada Goose, it provides a reasonable index of trends. Dating from 1967, Minnesota BBS data document the species’ spectacular recovery and rapid population growth. Although statistically these data lack a high level of precision, they demonstrate an average annual increase of 17.65% from 1967 to 2015 (Sauer et al. 2017).The first year the geese were detected on a BBS route in Minnesota was in 1972 (1 lone bird); in the decade from 2006 to 2015, an average of 1,364 birds were reported across the state each year (retrieved from Minnesota BBS data made available by Sauer et al. 2017). Across the entire BBS survey region of southern Canada and the United States, Canada Geese have demonstrated a significant annual increase of 9.17% per year (Sauer et al. 2017). The second long-term monitoring effort is a more targeted survey tool established by state waterfowl biologists. It is designed to monitor waterfowl populations in the portion of Minnesota (39%) that supports the highest density of lake basins outside of the densely forested region of northeastern Minnesota. 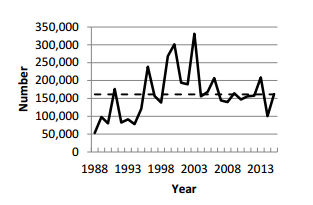 Conducted since 1968, the survey shows a steady increase in Canada Goose numbers, amid wide fluctuations, until the first decade of the 21st century, when numbers dropped and stabilized at approximately 150,000 birds (Cordts 2015; Figure 8). Conducted in May each year, the survey results for Canada Geese, as well as for all waterfowl, are strongly influenced by spring ice-out dates, precipitation, and the resulting number of spring ponds available for nesting. Finally, in recent years Minnesota waterfowl biologists have also conducted a targeted statewide survey of Canada Geese in late April during peak nest incubation. Although it is broader in extent than the May survey described above, it excludes the Twin Cities metropolitan area, the the Boundary Waters Canoe Area Wilderness, and Lake and Cook Counties. While there have been some fluctuations, this survey has indicated a relatively stable population trend since it was initiated in 2001; it has reported a statewide annual average of 320,000 geese from 2011 to 2015 (Figure 9). The statewide management goal is 250,000 geese; the management goal for the survey area is 232,500 geese (Peak 2015). Mississippi Flyway Giant Canada Goose management units (Zimpfer et al. 2015). Population Trend of the Giant Canada Goose (B.c. maxima; data from Zimpfer et al. 2015). Minnesota Canada Goose numbers adjusted for visibility bias; dashed line is long-term average (Cordts 2015). 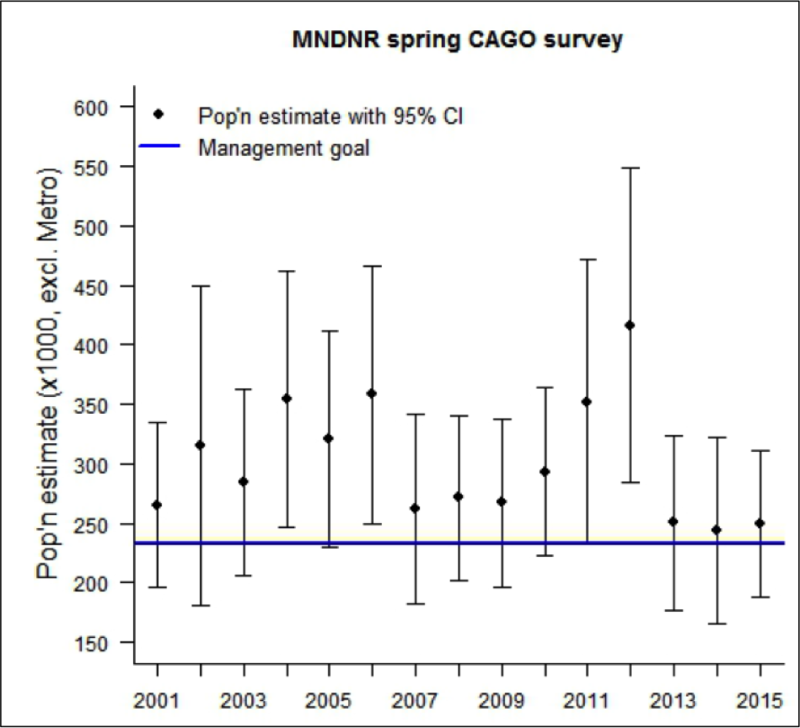 Resident Canada Goose population estimates (+ 95% Confidence Interval) in Minnesota (excluding Metro), 2001-2015. The statewide management goal is 250,000 Canada Geese; the management goal for the survey area is 232,500 (Peak 2015). As populations recovered, management of the Giant Canada Goose switched from extensive reintroduction efforts beginning in the 1940s to control of nuisance populations in urban settings by the 1980s. Anyone who has visited a city park where Canada Geese reside is aware of the challenges posed by excrement and overgrazing. Their presence at airports also poses a very serious, and ultimately dangerous, air safety hazard. The well-known incident in 2009 when U.S. Airways Flight 1549 struck a flock of Canada Geese shortly after take-off from New York City’s LaGuardia Airport is a testament to the hazard posed by local flocks. Resident geese became such a nuisance in the Twin Cities that relocation efforts were begun in the 1980s. Geese were rounded up from city lakes and transported to states farther south to facilitate additional recovery efforts. It was not long, however, before the populations in southern states grew to a level that those states would no longer accept additional birds. Today eggs are oiled to prevent hatching, shorelines are managed to make them less attractive to geese, and birds are collected in the fall, processed, and donated to local food shelves. After 30 years of focused efforts, the Twin Cities’ goose population reached its lowest level in decades in 2015 (Smith 2015). In rural areas, the MNDNR has also issued kill permits to farmers and used special hunting seasons or conservation actions to reduce population growth rates in areas where crop damage and other problems occur. Even though the Canada Goose is a popular game bird, the level of harvest does not impact population levels overall. In the United States, approximately 2 million birds were harvested during the 2015-2016 hunting season, and 142,200 were harvested in Minnesota (Raftovich et al. 2016). Indeed, many states, including Minnesota, have established early-season hunts to reduce the population of resident geese before the more northern migrants pass through (Minnesota Department of Natural Resources 2015). In light of its importance as a game species, the North American Waterfowl Management Plan (2004) has designated the Canada Goose a High Continental Priority. Given its wide distribution and minimal threats to its habitat, Partners in Flight (2017) has assigned it a relatively low Continental Concern Score of 6/20. Ultimately, aggressive management and control efforts may slow the species’ rate of population growth throughout its range. But the adaptable Giant Canada Goose, once thought to be gone forever from Minnesota’s wetlands, is now here to stay. Baldassarre, Guy A. 2014. Ducks, Geese, and Swans of North America, Volumes 1 and 2. Baltimore, MD: John Hopkins University Press. Hanson, Harold C. 1965. The Giant Canada Goose. Carbondale: Southern Illinois University Press. Hatch, Philo L. 1892. First Report: Accompanied with Notes on the Birds of Minnesota. The Geological and Natural History Survey of Minnesota Zoological Series. Minneapolis: Harrison & Smith Printers. Minnesota Department of Natural Resources. 2015. Minnesota Waterfowl Hunting Regulations Handbook. St. Paul: Minnesota Department of Natural Resources. Zimpfer, Nathan L., Walter E. Rhodes, Emily D. Silverman, Guthrie S. Zimmerman, and Ken D. Richkus. 2015. 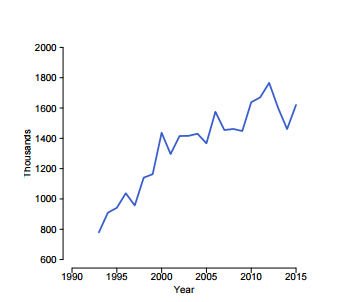 Trends in Duck Breeding Populations, 1955–2015. Laurel, MD: U.S. Department of the Interior, Fish and Wildlife Service, Division of Migratory Bird Management.